Content is still king. As true today as it ever was. Our time is precious. What we consume needs to add value, no matter what the medium or platform. 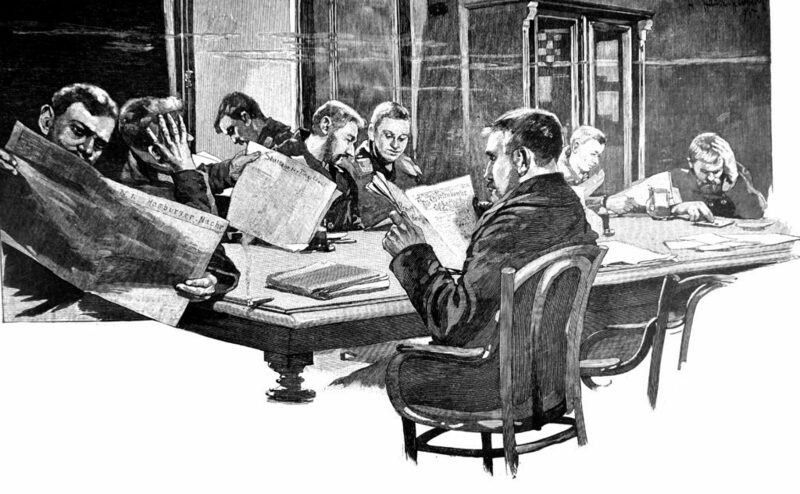 It’s a fact that, despite technology effortlessly shifting media consumption and data delivery, spawning new language, and sometimes running amok, there is a calm center where “traditional” skills — storytelling, excellent writing, data analysis and presentation, research, and strategic “dot connecting” — remain key, especially in B2B content. The French phrase “plus ça change, plus c’est la même chose” comes to mind… The more things change, the more they stay the same. Communications tools, platforms, technology, and terminology are constantly moving targets. It’s one of the things that keeps the business we are in exciting. We’re all part of that change, willingly or not. It has disrupted the media and journalism landscapes, particularly in B2B content. We’ve seen many editors and journalists cross the divide to become agency or in-house B2B content leaders. However, pairing timely, well-crafted, asset-rich content with sound content strategy, distribution, and measurement is nothing new. Society has been doing it for centuries, although the tools have changed, naturally. 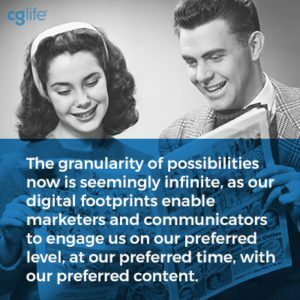 The granularity of possibilities now is seemingly infinite, as our digital footprints enable marketers and communicators to engage us on our preferred level, at our preferred time, with our preferred content. It’s highly personalized and custom-built. Over the past 15 years, we’ve seen a paradigm shift in the media as high speed “always on” and robust connectivity has opened up new content delivery channels, while smartphones and tablets have provided the platform for consumption of that content. Along with that there has been a sharp decline in print media, across both newspapers and magazines. What this all boils down to is that people are still hungry for news and information. The demand for compelling storytelling remains. We just consume in a digital format as opposed to hard copy and we consume often in multiple screen formats, supplemented by streaming media and live-casts. We now have a generation that is growing up with the touchscreen and the “swipe” as the mode of information. In many areas, life is decluttering itself, with physical elements being replaced by digital assets stored on hard drives or in the cloud. Music, video, photographs, and work documents are all now represented as gigabytes and terabytes. We’re a highly portable, device-centric society. In its favor, digital content and media offer a great deal — convenience, portability, and most importantly for businesses, traceability, and measurability. It also reduces costs for businesses that no longer have to produce a physical product, rather a digital one. Of course, this brings with it the associated issues of duplication and piracy, but this is not a new problem. Anyone remember the “Home Taping Is Killing Music. And It’s Illegal” stickers? What remains true amidst all of these changes is the need for well-written and well-presented content. Great content is great content. 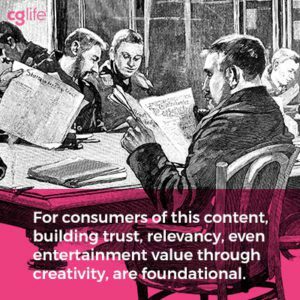 For consumers of this content, building trust, relevancy, even entertainment value through creativity, are foundational. Convenience and ease of access to content are key. We process so much content that we tend to scan ratherthan read, so framing the content to deliver the top-level punch is key. Keywords, keywords and more keywords. Compelling images. Data that leaps off the screen. You can’t really tell a story in 280 characters. Social media, at least in a business sense, is primarily about driving traffic, about creating followers, about leading us somewhere. And that somewhere has to have appeal, have “stickiness,” so that the reader returns. The main change in the new “social economy” dynamic is that has blown open communications to give everyone a voice, if they want it, for those willing to invest time and energy into creating a narrative and engaging in a conversation. Importantly, it gives business a direct line to customers, and those customers a public voice. As a result, businesses by necessity need to be accountable, responsive and engaged. How businesses can successfully strategize so that they are fully engaged in, and responsive to, social media, is a whole different discussion. Suffice to say, the upshot is that individuals and businesses are empowered. They can now be content providers, a destination for their own editorial information, opinions, news, and viewpoints. This is not to say that media outlets, be they print or online, are dead. Far from it; they crave quality content just as they always did. What’s more, the third party endorsements that independent editorials offer carry a great deal of weight. However, in the evolving media landscape, companies have a direct hotline to their customers and targeted, original content that adds value to the reader is well curated/created, is objective, and can co-exist in addition to, and in conjunction with, third-party editorial. Partnerships with media platforms through advertising, placement of content, sponsorships, and so on can drive traffic to an organization’s content and help to position that entity as an authoritative voice and valued resource for information. As with marketing and communications in general, the focus and messaging differ by the target customer group and the nature of the business. Consumer-facing campaigns tend to be lifestyle-driven and geared toward a certain demographic, and are more general in nature. I doubt that Coca-Cola, for example, knows exactly who drinks their products. But they do have targets for specific products and spend a hell lot of time and money researching customer demographics, their interests. and discovering what influences customer purchasing choices. By contrast, companies operating in the B2B space are generally much more aware of their customer base. They know the products or services that their customers purchase. They have contacts within customer organizations through their sales teams. It’s a much more tightly defined audience. This “closed” group relationship opens up a great opportunity to proactively build brand awareness, identify and talk about key industry issues, highlight trends, discuss solutions and directly engage with those people who actively use a company’s products and services. Devote professional resources to creating your content: Have your marketing and PR team or agency work on it. Many respected editors and journalists now work on a freelance basis and have incredible contacts and knowledge. Talk to them. Engage them. Don’t lose sight of the big picture: What is the key objective overall? Tie all efforts back to that as much as possible. Know your audience: Who are the consumers? How do they make decisions? What challenges do they face? What are their key determining factors on a daily basis? Cost? Speed? Convenience? Reliability? Reputation? Availability? Support? Most likely it is a combination of many. Be relevant: Ensure that what you are saying is highly relevant to the intended audience (this goes without saying of course). What are the industry issues and drivers? Relate content to this. Inspire leadership and relevancy. Who is creating the content? Focus on buy-in from across the organization and invite experts from inside and outside to take part. Involve your sales function. They are the front line with customers for the most part. Set solid expectations on tone, content, and objectivity: People are more open to receiving direct communications from companies, but dislike blatant sales pitches. Context is everything. Follow-up with your content creators. Keep moving the narrative forward. Be exclusive: Create content that is unique such as roundtable discussions with customers, key influencers, and analysts. Interviews with those shaping your industry. Comment on news stories that affect your industry and how you view them. Get creative: You have a blank canvas to work with. Try to inspire the next generation. Offer giveaways and incentives or goodies. Be objective: No-one wants to read content that is all “me, me, me.” You can talk about how your product or service differs or adds value for your customer, but this needs to be put into a market context and backed up with solid data. Communicate the difference. Ensure that the tone is pitched correctly: If we are talking to a highly technical audience, the content should reflect this. Be honest: False claims and vague data will be questioned. Ensure that you are on point. Don’t get caught with proverbial egg on your face. Have a forum for questions and feedback: A two-way discussion is a key element in discussing content and enabling those interested to find out more. Be regular: Like your doctor always told you, it’s good to keep things regular. Many companies initially are excited about publishing their own content, but then interest falls away. Commit to regular content updates. And prune juice. Encourage sharing: Allow your readers to share your content via email or social media. Promote it: Use your social media channels, email campaigns, Salesforce and existing media channels to promote your content. Encourage opt-ins. Have a speedy process in place: Issues can arise and develop fairly quickly. Having a nimble team to monitor, assess, and create relevant commentary can enhance credibility. There are no bad ideas: OK, there are, but let’s not stymie creativity. Options are good. Video, audio, animation, infographics, compelling copy — everything is up for grabs. Enjoy the challenge – Be open to learning from the experts you work with. It goes without saying that content needs to be well-presented, easily digestible, and not a mobile data glutton. Optimize for mobile, and use tools to ensure that your initial monitoring and research, executed correctly, will give you the right path(s) to your audience(s). In terms of measurement, you can go as in-depth as you like, so mapping these elements to your initial objectives and optimizing that process is key from the outset. Having a digital specialist on the team is a must. In summary, creating your own editorial content is a golden opportunity to build an audience, add to your “tribe” of followers, reinforce your messaging and position your organization as a proactive thought leader. Done correctly and objectively, creating compelling content can be a real win-win.